The air was thick with excitement. Crowds were gathering and the usually quiet street hummed with energy and anticipation. Siem Reap’s Giant Puppet Parade was about to get underway. The excited chatter of children increased as the lights flickered on inside each puppet. Further back drums pounded out a rhythm, building the excitement and ahead The Lion Sleeps tonight was on repeat. The atmosphere was thick with excitement and laughter. Around me a giant caterpillar was glowing green and the shouts of zip zap, boing were getting louder. And finally we were off. A huge red ant led the way past the busy Old Market and through the heart of Siem Reap’s streets. It was followed by an enormous lion – its tail twitching, and its testicles swaying as it moved – I kid you not. And finally the caterpillar I was there to photograph, was on its way. 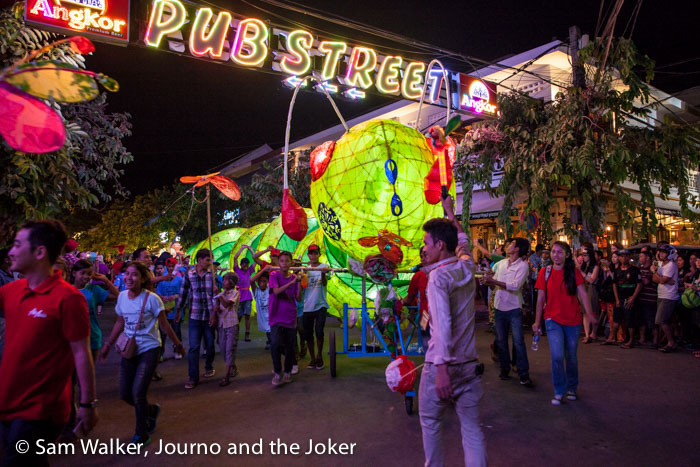 It was easy to see why the Giant Puppet Parade has become one of Siem Reap’s annual highlights. 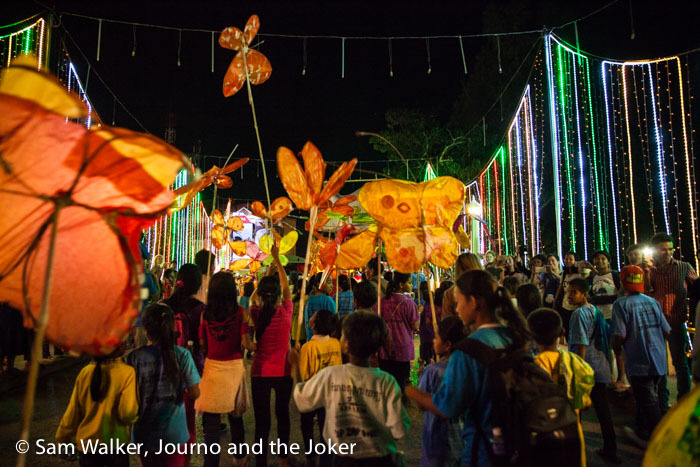 The project is Cambodia’s largest children’s community arts project but they are not childish creations — rather they are clever artworks, whose size, colour and lighting achieve their effect of wowing the crowds. 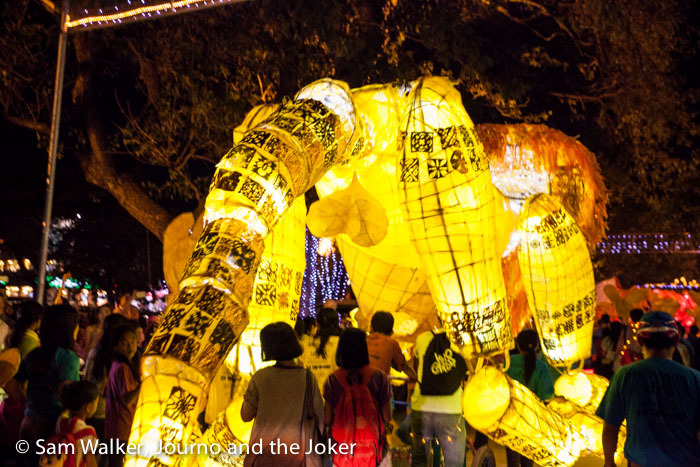 The puppets are constructed from bamboo and rattan and covered in tissue paper and cellophane during three weeks of workshops in the lead-up to the parade. They are based on the ancient Chinese dragon puppets and vary in size from about 10 metres to 30 metres. Children from local schools and NGOs make them at Wat Damnak and the results are spectacular. 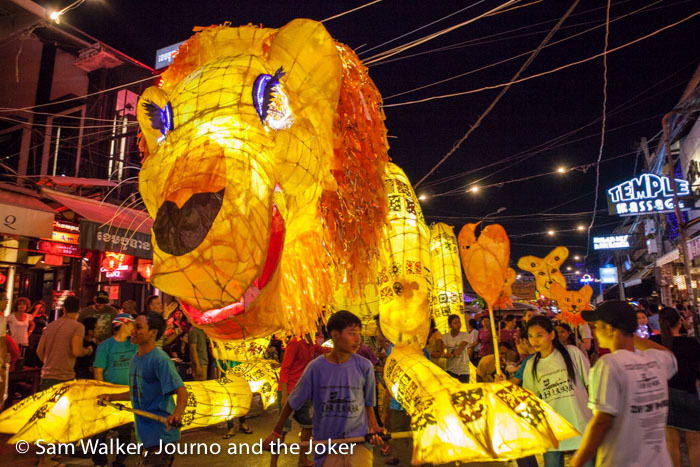 They are made under the supervision of the Puppet Parade’s organisers and with help from members of the Phare Ponleu Seplak Arts School in Battambang. 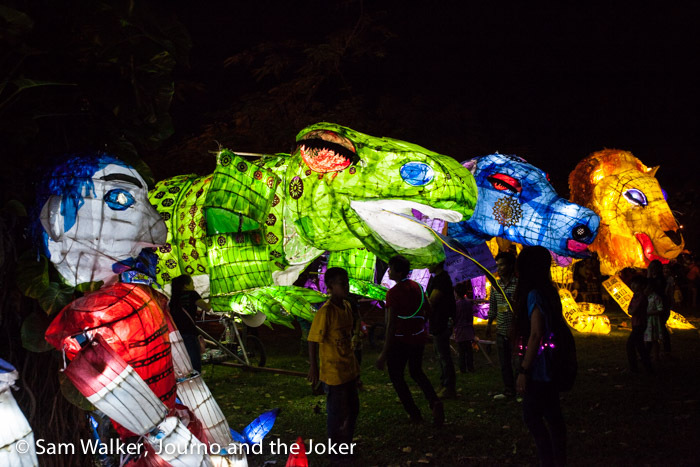 Each year the puppet designs highlight issues of relevance for Cambodia, including educational, cultural and ecological themes, which include endangered species, hygiene, environmental awareness and important cultural themes. This year’s puppets included the giant ant, a lion, a caterpillar, a duck, a monitor lizard, a team of soccer players and a monkey, in honour of the Chinese Year of the Monkey. The attention to detail was incredible. The lion’s eyelids closed and the lights in the monitor lizard’s eyes faded and glowed as if it was closing it’s second eyelid. As we danced and paraded our way through the streets the crowds got thicker and we came to a halt under the bright lights of Pub Street. Here, Phare circus performers joined the act, putting on a fire twirling, acrobatic and juggling show, while the lion periodically roared and the drums continued to beat in the background. The crowds were thick and the excitement was plentiful — from participants and bystanders. The convoy of puppets meandered through the streets and over the bridge. As well as the giant creations many smaller motifs, lighter and easier for the young ones to manage were being waved through the air — small lions faces and butterflies among them. The procession wound along the river. The excited squeals of teenage girls, almost deafening as they competed to be heard amidst all the other noise. Finally, we crossed the river again, winding up at the Royal Independence Gardens, where many members of the community joined in the festivities and got up close to the giant puppets. The 10th puppet festival took place last Saturday night and is usually held every February. Hi Charu. Thanks for checking it out. Yes, I had heard it was good but didn’t realise just how good until I saw it. It is a fantastic festival for Siem Reap. I’m sorry to have missed it. I found out about it after I had booked my tix to Thailand for a little break. Thanks for the catch up though and all the information about the event! Ah, what a shame Lani. Maybe you’ll be here for next year’s puppet parade. It seems to be getting bigger and better every year. Wow that looks amazing!! I would love to go there. Thanks for sharing! Hi Chaptertravel. It was amazing. The place was buzzing and the kids involved were so excited to be a part of it. Thanks so much for including us The Travelinggals!